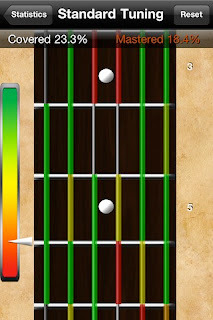 It is a long holiday weekend here in the United States, and to celebrate the beginning of summer, we have decided to make our latest application for iPhone and iPod touch, Guitar Trainer HD, available for free! If you play any stringed instrument (guitar, bass, banjo, ukulele or mandolin), you will want to take advantage of this limited time offer to get this great educational tool. The regular price ($2.99 in the US) will come back into effect on May 31. So don't wait and get your copy right now! We are proud to announce the release of our first major new iOS app, Guitar Trainer HD. While the original Guitar Trainer app has been available for a few years now for legacy Java platforms and BlackBerry, this new version of the software is an important evolutionary step forward and provides musicians with a beautiful tool to improve their knowledge of their instrument. 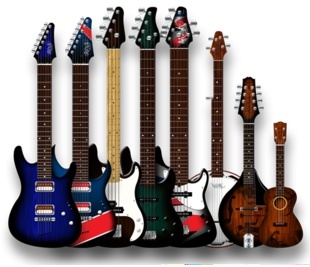 The app features 8 different instruments so far: guitar (6 and 7 strings), bass (4, 5 and 6 string variants), mandolin, banjo and ukulele, each with their own custom sounds, a variety of built-in tunings, and the ability to define your own custom tunings. Like the original Guitar Trainer app, both a training mode and a game mode (with levels) are available. The game mode also takes advantage of Game Center on iOS 4.0 and later, allowing you to compete and rank with your friends. Achievements can also be earned throughout the application as you make progress. Additionally, a Free Play mode allows you to simply play with the instrument as you wish. Guitar Trainer HD is available worldwide and retails at $2.99 in the United States, which includes full support for the 6-string guitar. Additional instruments can be purchased from inside the app. A universal version of the app will bring full iPad support soon. Get your copy now and you'll be eligible for a free upgrade when it becomes available! If you'd like to review the app, we can provide you with a promotional copy of the software. Please contact us directly with your request.